Most Environmentalists tend to be Leftists who insist on censoring, blocking and sometimes destroying human use of the environment for productive purposes. Going way beyond conservationism, they seek legal limitations on human use of the Earth's natural environment and resources. Media reporting usually blurs the distinction between "no-use" environmentalism and "wise-use" conservation. Some liberals who promote left-wing policies claim to be "conservative" in order to deceive conservatives into adopting socialist policies. Passionate environmentalists reject the proposition that love of nature is ennobling because loving nature is good for human dignity and happiness. They flirt instead with a worldview in which human beings are a species on a par with every other, and nature is to be protected not because you damage other people's happiness when you destroy it wantonly but because nature itself has rights to assert against man. The Smithsonian, for example, posted a label in its Museum of Natural History apologizing for a display in which “humans are treated as more important than other mammals." In June 2007 residents of Lake Tahoe California were furious at environmentalists and the grip they hold on government regulators who refused to allow the clearing of dead trees. 1,300 homes sustained damage, and the newly homeless victims blamed the special interest environmentalists for their woes. The amount of fuel in the Tahoe Basin reached critical levels after years of discord among environmentalists and government agencies over how to thin forests and reduce the fire threat. And it has led to predictions of a devastating wildfire because the basin is one of the areas with the most fire starts in the Sierra Nevada. Citing a heretofore unknown connection between the environment, animal rights, and vegetarianism movements, People for the Ethical Treatment of Animals (PETA) requested of Democratic Speaker of the U.S. House of Representatives Nancy Pelosi and Senate Majority Leader Harry Reid special treatment in administration of tax laws used to support ecological sustainability. PETA President Ingrid Newkirk alleges, "[V]egetarians are responsible for far fewer greenhouse-gas emissions and other kinds of environmental degradation than meat-eaters," and that vegetarians should receive a tax break "just as people who purchase a hybrid vehicle enjoy a tax break." “ The religion of environmentalism is a perfect 21st century remapping of traditional Judeo-Christian beliefs and myths. There's an initial Eden, a paradise, a state of grace and unity with nature, there's a fall from grace into a state of pollution as a result of eating from the tree of knowledge, and as a result of our actions there is a judgment day coming for us all. We are all energy sinners, doomed to die, unless we seek salvation, which is now called sustainability. Sustainability is salvation in the church of the environment. Just as organic food is its communion, that pesticide-free wafer that the right people with the right beliefs, imbibe. Eden, the fall of man, the loss of grace, the coming doomsday---these are deeply held mythic structures. They are profoundly conservative religious beliefs. These are not facts that can be argued. These are issues of faith. Facts aren't necessary, because the tenets of environmentalism are all about belief. It's about whether you are going to be a sinner, or saved. Whether you are going to be one of the people on the side of salvation, or on the side of doom. Whether you are going to be one of us, or one of them. Former U.S. Vice President Al Gore sees a "spiritual crisis" in global warming. He also believes that goddess worship is a better and more legitimate spiritual belief than Christianity and that the life of human beings is comparable to that of trees. British biologist James Lovelock  first publicly explained the Gaia theory - that the earth as a whole is a living, conscious organism. Rep. Helen Chenoweth (R-Idaho) has described this phenomenon as "environmental religion" and says that it has "profound constitutional implications" because of the First Amendment prohibition on government establishment of religion. Environmentalism has been called "school prayer for liberals", in the sense that it functions as a substitute spiritual experience for them, since they lack a true spiritual connection to God. This allows them to feel good about themselves, if only temporarily. Many Christians have looked to this passage to justify their use of the gifts God has left us in and on the Earth. Construction, farming, fishing, logging, mining, oil drilling, hunting, industry, and the like are all examples of human beings making the most of our dominion, converting it into glorious products that help our fellow man. Products like medicine, shelter, and food satisfy the basic needs of mankind, while other products make a life serving God easier and more effective. However, other Christians interpret this as stewardship, the belief that human beings are "caretakers" of the Earth. Deep ecology is an environmental movement that rejects modern culture and seeks to include non-human life in the moral circle. They find the cause of the current ecological crisis in the modern attitude towards the environment. The theory can be defined as the following principles; 1. The well-being and flourishing of human and non-human life on Earth have value in themselves. These values are independent of the usefulness of the non-human world for human purposes. 2. Richness and diversity of life forms contribute to the realization of these values and are also values in themselves. 3. Humans have no right to reduce this richness and diversity except to satisfy vital needs. 4. The flourishing of human life and cultures is compatible with a substantial decrease of the human population. The flourishing of non-human life requires such a decrease. 5. Present human interference with the non-human world is excessive, and the situation is rapidly worsening. 6. Policies must therefore be changed. The changes in policies affect basic economic, technological, and ideological structures. The resulting state of affairs will be deeply different from the present. 7. The ideological change is mainly that of appreciating quality (dwelling in situations of inherent worth) rather than adhering to an increasingly higher standard of living. There will be a profound awareness of the difference between big and great. 8. Those who subscribe to the foregoing points have an obligation directly or indirectly to participate in the attempt to implement the necessary changes. Issues that arise from the practise of this theory is where one life form needs another life form as food. Such an example may include humans needing to eat a cow, how would a deep ecologist jusitify this? According to the U.S. EPA, "sustainability creates and maintains the conditions under which humans and nature can exist in productive harmony, that permit fulfilling the social, economic and other requirements of present and future generations." There are two things wrong with this liberal concept of sustainability. The first is that it directly contradicts the word of God (as described above), since living in productive harmony is not the same as humans having domion over nature. The other important point is that the EPA's definition does not take into account rapidly changing social and economic conditions. There are numerous examples of economically or socially valuable activities that are not regarded as "sustainable." ↑ Mooney, Kevin (February 27, 2019). Beware the liberal green activists masquerading as conservatives at CPAC. Washington Examiner. Retrieved February 27, 2019. ↑ Crowd aims fury at regional panel, Land use agency is criticized for failing to allow adequate clearing of combustible materials. By Eric Bailey and J. Michael Kennedy, Los Angelas Times, June 26, 2007. ↑ PETA seeks tax breaks for vegetarians, By Ilan Wurman, The Hill, May 31, 2007. ↑ Michael Crichton, Environmentalism as Religion," Commonwealth Club, San Francisco, CA, September 15, 2003. 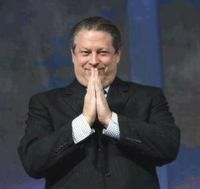 ↑ Gore sees 'spiritual crisis' in warming, Anton Caputo, San Antonio Express News, 05/05/2007. ↑ Cliff Kincaid, Al Gore, the United Nations, and the Cult of Gaia, (1999). ↑ Local scientist calls global warming theory hooey, Samara Kalk Derby, The Capital Times, 6/18/2007. This page has been accessed 61,999 times.